Bio-Pak Tropical Scent holding tank treatment is the new modern way to control holding tank odors and clean the tank at the same time. Bio-Pak is an advanced enzyme formula that is totally biodegradable and has no harsh chemicals such as formaldehyde or alcohol. 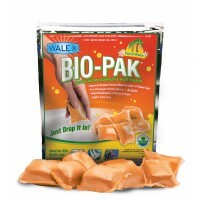 Bio-Pak comes in a handy DROP-IN sachet that you drop in the toilet bowl once a week. It will break down waste and even paper giving you more room in the tank and it will liquefy waste for an easier pumpout. The bag contains 10 sachets which are clean and dissolve immediately when in contact with water. The microbes in Bio-Pak then start to feed on the bad odor causing microbes in your tank. The Bio-Pak will destroy aerobic and anaerobic microbes deep inside your tank. In addition the Bio-Pak will clean any sensors in the tank.